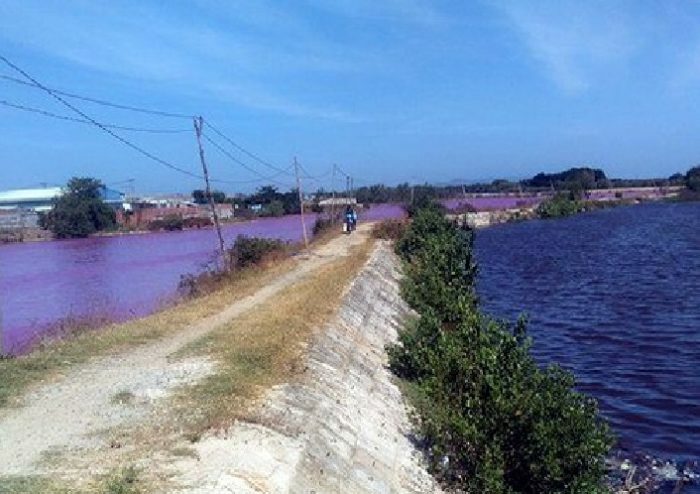 The water in a reservoir in the southern province of Ba Ria-Vung Tau, Vietnam has turned purple & stinky overnight. Residents are concerned about pollution, or could it be a rapid growth of algae? The 10-hectare (25-acre) reservoir, which stands next to a group of seafood processing factories, is linked to ditches & the downstream of the Cha Va River, home to 100s of fish farms. In recent years, Vietnamese people have become increasingly wary of pollutions driven by production expansion as the seafood industry seeks to catch up w/overseas fast-growing demand for shrimp & fish. 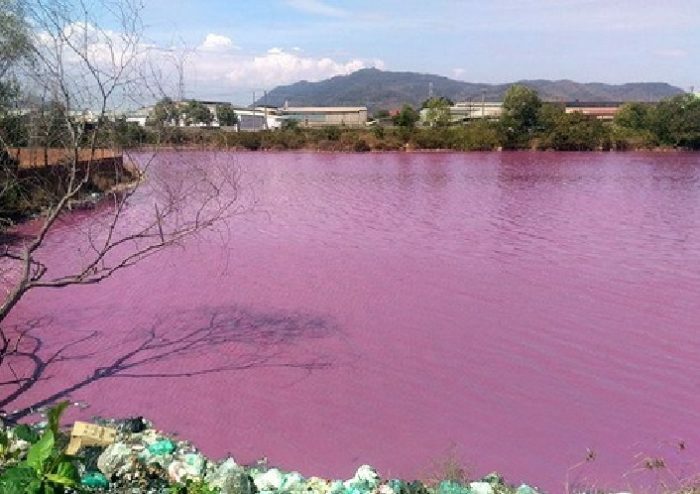 The reservoir turns purple anytime the processors discharge wastewater. And according to residents, it’s been like that for many years & the authorities have not really done anything to stop it. The concerns of the locals are compounded as children in the area also fall sick regularly. Officials know the problem w/the waste discharge but are not handling. They now have to close the reservoir to treat the water & sediment. Last December, a court in Ba Ria-Vung Tau ordered 11 seafood companies to recompense local fish farmers VND13 billion ($570,800) as their waste discharge was accused of killing tons of fish on the Cha Va River in 2015. Pollution, mass die-off… we are killing our Earth!